When a 20-something bachelor wasn’t sure how to best update his dated kitchen and express his personality with his limited budget, he turned to designer Kristy Kropat for help. 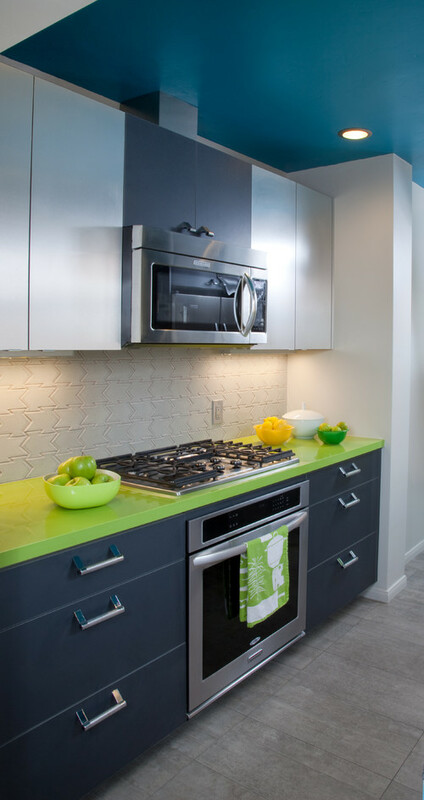 Kropat found that her client liked lime green, teal and stainless steel and had an interest in cars. Taking all this into account, and within a limited budget, she was able to deliver a personalized, updated space that respects the San Diego home’s mid-century origins. 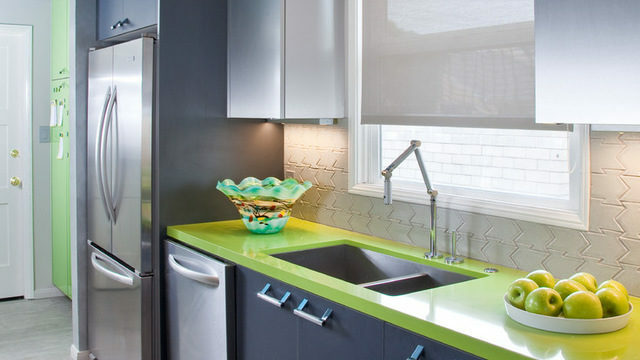 Lime green countertops immediately signal that this isn’t an ordinary kitchen. While the color isn’t for everyone, Kropat, who likes to use bold color, was glad when the homeowner agreed to the choice. But she didn’t stop there. 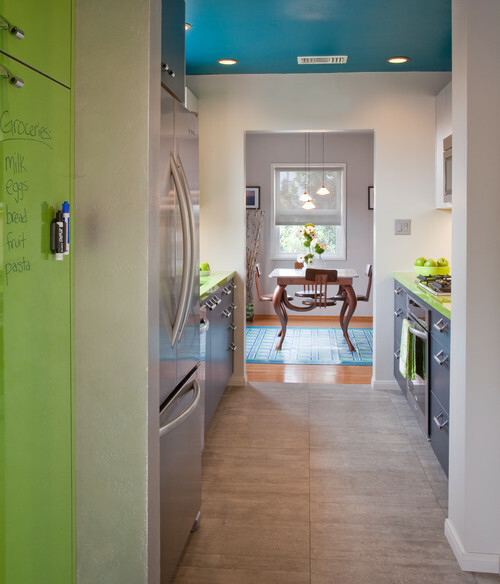 She took the homeowner’s second color choice, teal, and applied it to the ceiling. To balance the bold color choices, she went with neutral gray hues for the floors, cabinets and walls. “You have to be careful with color,” she says. “Use a bright color on horizontal surfaces rather than vertical ones. It’s less intense than using it on a wall. 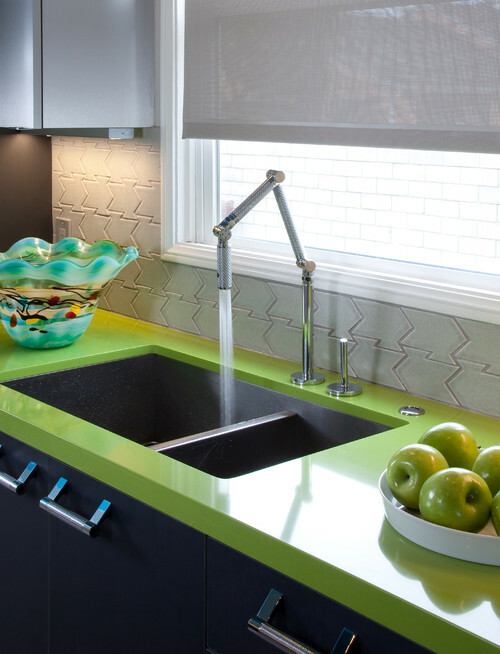 A wall can really be in your face.” 8 Great Kitchen Color Schemes Worth Trying. 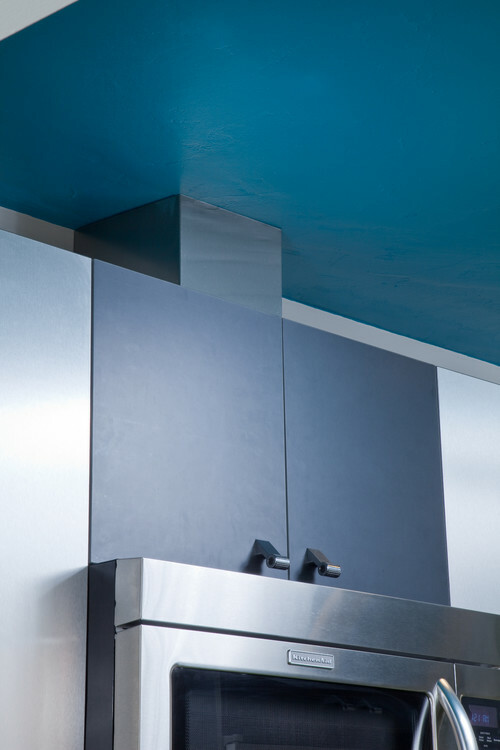 Stainless steel laminate upper cabinets add an industrial look that recalls an automotive garage. Subtly textured gray laminate forms the base cabinets. “It’s durable and low-maintenance, and also helped keep costs down,” she says. Kropat installed a cooktop and oven rather than a range to avoid chopping up the run of countertop, which would have been necessary to slide in a range. The countertop, fabricated from engineered stone, is 1¼-inch thick, which eliminated the need for a glued edge. It’s a cleaner look and also saves on labor costs. Undercabinet lights provide extra illumination throughout the space. The lower cabinet and drawer handles resemble hardware on cabinets in motorcycle shops, another nod to the homeowner’s interests. 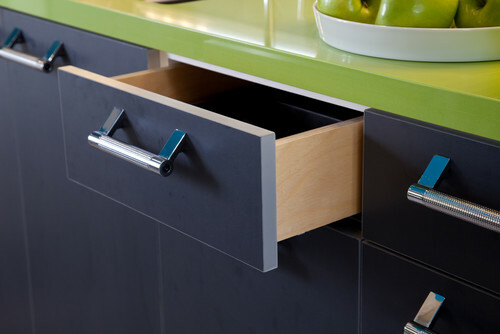 Kropat added stainless-looking banding to the edge of the drawers to provide a finishing detail. Give Your Kitchen Cabinetry a Brand New Look With These Unique Drawer Pulls. A ceramic tile backsplash recalls car tracks. She color-coordinated the outlet covers to make them blend in. The designer set aside some of the budget to splurge on the faucet. “You always want one or two things as a focal point,” Kropat says. The deep sink is large enough to hold bigger pots and pans and features a button on the countertop to operate the garbage disposal. Kropat had a metalworker fabricate a stainless steel vent hood above the microwave to help tie it in with the cabinets. Porcelain floor tiles in six different shades mimic the look of a concrete garage floor. 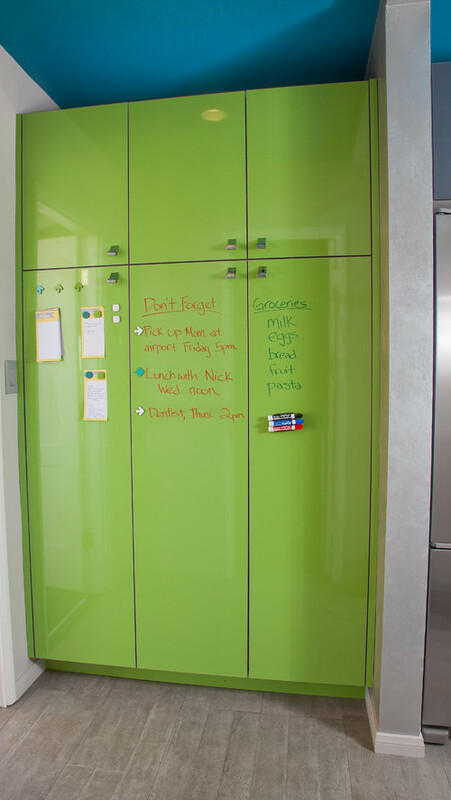 Green laminate pantry doors are magnetic and dry-erase, creating a handy message board. What’s the Perfect Pantry for Your Kitchen?